Chinatown has always held a special place in my heart. I have memories of early childhood, gathered around a big lacquered table at a particular restaurant in Seattle's Chinatown. My grandfather would usually be the reason for gathering us there-- in celebration of either his or my mom's birthday. He'd order steaming bowls of won ton soup, piles of sesame noodles, fried baby octopus, and almond gravy coated chicken. And, we'd sit and talk and eat and eat and eat. My mother continued my love for Chinatown by taking us to the international district's supermarket to search through the tiny aisles and small stairways that led to additional dusty rooms of treasures. My love for chopsticks and tiny rice bowls and exotic candies was fostered in those dusty halls. As a college student, I ventured north of the American border and discovered the Chinatown of Vancouver. Again, over steaming bowls of soup, Chinatown worked its way into my personal history with a particularly eventful birthday lunch as my parents visited and I shared my dislike of early college life. Then, while living in San Francisco, I journeyed down Grant street more times than I can even count popping in and out of stores with rickety stairwells. Each time, leaving with a new tiny vessel for soy sauce or a set of meditation balls or a set of chopsticks as a memento of my day's adventure. And, even while living in Philadelphia, I sought out the teeny tiny Chinatown in need of a little bit of exotic discovery. Today, I wander the twisty windy alleyway known as Sampeng Lane, the heart of Bangkok's Chinatown. The long Lane is unlike any other Chinatown I've experienced before. Like other Chinatowns, the streets are alive with endless flows of people bustling from fabric stores to produce stands to trinket stalls. But, here, the main purpose of excursions seems to be to buy in wholesale bulk. Many stores won't sell single items, purely dealing in wholesale lots exclusively. As you walk the tiny lanes single file with other shoppers, it's difficult to imagine any motorized vehicles fitting through the "roadways." That it, until a motorcycle carrying a towering load of cardboard boxes beeps behind you and flies down the awning covered pavement. Sampeng Lane journeys for blocks and blocks of the city, winding in and out of noodle shops and shoe sellers and repair stands along the way. A full morning only allows one to barely begin to explore Bangkok's Chinatown. But, after a couple of hours in Sampeng Lane, I've easily picked up a new soy sauce dish, a bag of exotic fruit and another day of memories to add to my own personal history with the world's Chinatowns. This dish is rich and decadent. I recommend you serve it alongside something light and refreshing (like Green Papaya Salad or my version of a classic summer Fruit Salad) and with a glass of beautiful summer wine or an icy pitcher of beer. Cook the noodles in vigorously boiling water until al dente in texture. Meanwhile, combine the peanut butter, boiling water and soy sauce in a skillet and mix until smooth. Add the cream and red pepper flakes and bring to a simmer over low heat. Drain the noodles, do not rinse, and transfer to the pan containing the sauce. 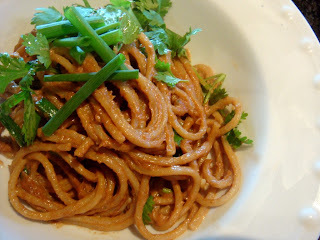 Toss to coat the noodles and bring to a very hot temperature. Transfer to a serving platter and sprinkle with cilantro and green onions. These are best served steaming hot. *Since my daughter is allergic to peanuts, I use a home made cashew butter instead of peanut butter and make sure to add a little bit of extra salt to closer replicate the flavors of this recipe. We've tried this with almond butter to a lesser success. Sounds like you left your heart in Chinatown (or maybe San Francisco's Chinatown!). looks like you had quite an experience walking through Sampeng Lane leaving behind great memories! I can't wait to try these noodles. They look like a wonderful dish and noodles are always a perfect way to celebrate china town (anywhere in the world you go, there's always amazing noodles in china town). The noodles are great. I surprised my wife with a Thai dinner last night- made your noodles and the green papaya salad (used cucumber because I couldn't find green papaya). Lit some candles and had a great evening. Your recipes made the evening possible. Thx.